Greetings Film Fans! Hope everyone is enjoying a great holiday week, with some good Christmas flicks playing almost round the clock on cable. Some of the highlighted films that were chosen to be preserved in the National Registry include Jurassic Park from 1993; Kubrick’s The Shining from 1980, Hud with Paul Newman from 1963 and Cinderella, the Disney classic from 1950. One of our 6 Degrees favorites, Mary Poppins, has been updated in the non-remake Mary Poppins Returns, which has generally opened to good reviews. Aquaman, the comic book holiday entry, has had some fairly good and some lukewarm reviews. Jean Luc Godard has a film opening in January. The Image Book ‘speeds through classic film clips, disposable film clips and wartime imagery ‘as he grapples with the relationship between the violent power struggles that dominate the real world and their sanitized versions in movies” (I can tell you that I’m going to have to see this more than once to understand it!….But it does sound intriguing). Arctic with Mads Mikkelson was ‘written as a sci-fi adventure set on Mars’ originally. It’s said there’s a bear scene ‘that puts The Revenant to shame’ so stay tuned for lots of survival of the fittest in this snow packed adventure. Greta is described as a ‘nutty…strange little thriller’ and a campy B-type movie that is fun. Starring Isabelle Huppert and Chloe Moretz, this one might be a sleeper hit. Fast Color, opening in March, may be just what we need in this day and age; a different kind of superhero story. “A fresh variation on the superhero story” in a near-future dystopia setting is the description given. It would be a refreshing change to see ANY type of variation of the standard superhero movie! 6 Degrees Magazine offers reviews and deep dives into Mary Poppins Returns. Also there are reviews of Aquaman, All is True from Kenneth Branagh and Roma. Roma from director Alfonse Cuaron has been getting great reviews and is a heavy contender as we head into awards season in Hollywood. It’s hard to believe but true-Christmas is almost here! So for those Armchair Film Fans, I recommend kicking back the day after Christmas with a Cary Grant Film Festival on Turner Classic Movies that includes The Bachelor and the Bobby Soxer, Mr Blandings Builds his Dream House, Topper and North by Northwest, which are some of Mr Grant’s best work. For music and especially rock music lovers, there’s A Hard Day’s Night, Jailhouse Rock and Tommy all being shown on Turner Classic back to back for a true Armchair Film Fan Extravaganza! Hello and welcome to October, Film Fans! This week, 6 Degrees magazine has reviews of the top films at the movies now. A Star is Born has opened to generally good reviews, both for Lady Gaga’s acting and this particular retelling of a story that has been told and retold countless times. The Old Man and the Gun, Robert Redford’s crime caper, has been well received and is reviewed on Ebert.com. Smallfoot, the animated children’s movie, opened to mixed reviews; and Venom was widely anticipated as it features Tom Hardy, an A-list actor. But this movie, so far, seems to have received less than glowing reviews. Since it’s October, there’s always a run on posts written about horror films, and the biggest horror film debuting in October will be the remake of Halloween with Jamie Lee Curtis returning to the fold. 6 Degrees has several posts featuring the best horror films of 2018. And then there are the small screen films in October, including films for the Armchair Film Fest connoisseur. On Turner Classic this month, I was excited to see the 1940 film Night Train to Munich with Rex Harrison in the lineup, as this movie is not widely shown. Hitchcock fans can record The Lady Vanishes and Strangers on a Train, both showing in October. TCM also is showing A Star is Born with Judy Garland from 1954, directed by George Cukor, which received good reviews. Probably all of the “Star is Born” films were received well, with the possible exception of Barbra Streisand’s remake, which seemed to most to be a tad self-indulgent. Another 6 Degrees classic remake on TCM is The Front Page from 1931, which was remade with Cary Grant and Rosalind Russell as His Girl Friday in 1940. Both are worth watching, but I always recommend any film that stars Cary Grant. He somehow managed to throw in his real name, Archie Leach, if you can catch it through the fast-paced dialogue in this one. Notorious is one of Hitchcocks best films. Why? Not because of the well-known movie stars that grace the film. Cary Grant and Ingrid Bergman are at the top of their game, but ironically, it’s not their performances that stand out in this movie. In Notorious, Cary Grant’s character is that of a cynical and slightly skewed personality. He comes off as a tad less than his characteristically perfect self. The Ingrid Bergman character is one of a fallen woman. She’s the girl who’s “been around the block”. She’s seen it all, done it all and is not a candidate for the illusion of true love. While the portrayal of Mothers in film usually conspire to be in a nurturing and protective role, as was so often the case with Hitchcock, the image of Mom is turned on its head. In this instance, “Mother” is someone who might give Lady MacBeth reason to pause, as the mom in Notorious is by far the more ruthless and calculating of villains in the piece. . That’s saying a lot, as the characters in the film are part of a group of Nazi sympathizers. Hitchcock was well known for the type of woman/mother figure portrayed by Madame Sebastian. In Marnie., the character of Tippi Hedrin’s mother was responsible for her young daughter’s psychotic behavior. In The Birds, Tippi Hedrin was again plagued by the domineering and darkly possessive mother figure. Then comes Psycho, with the most famously disturbed mother/son duo since Oedipus. In so many Hitchcock classics, we see a different image of a Mom; one who is less than sweet as apple pie in most cases. Such was the world of Hitchcock. The line Madame Sebastian delivers is to her own son, Sebastian/Claude Rains, who comes to her in anguish over the discovery that his new wife, Alicia/Ingrid Bergman, is in fact a spy. Frightened of the ruthless gang of Nazi cohorts he is entwined with, he comes to ask his Mother, Madame Sebastian, for advice. Madame Sebastian pauses a moment to light a cigarette, the perfect bit of “business” that lends credence to her next statement. She then tells her son that all is not lost. Why? Because, she says, “You are protected by the enormity of your stupidity-for a time .” It’s then up to dear old Mom to come up with the idea of slowly poisoning Alicia. The line works so well because it is played in such a matter of fact manner and given just the right amount of understatement to make the subsequent actions so completely evil. And now, so many years later, I am reminded from time to time of the cool and utterly ruthless cut given to Claude Rains. Most of the time, it’s a self-deprecating phrase I use to put myself in my place. And it’s a saying that works every time. It is the type of clever cut that never fails to make its mark. Perhaps, as put-downs go, it is one of the truly great ones.. In the end, we are all protected by the enormity of our stupidity! 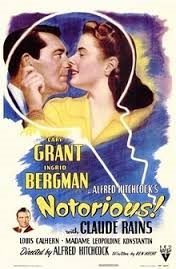 Notorious is playing at Tampa Theatre this Sunday, July 10th at 3:00 pm.